RETEZAT National Park, Carpathian Mountains – ROMANIA, Travel and Tourism Information. Hiking in Retezat National Park you may well lose your breath, not from the climb, but from the breathtaking views of nature at her wildest. Peaks of differing heights, many topping the 8,028 ft. mark (such as Peleaga Peak), provide hikers with plenty of challenges. Travelers willing to tackle them will have their efforts well rewarded. Local communities and cultural sights from around the park area add a special value to that of the landscape and the biodiversity inside the park. The people in the villages of Salasu de Sus, Rau de Mori and Campu lui Neag preserve to this day the traditional lifestyle of the area. -Being the oldest Romanian national park - established in 1935. 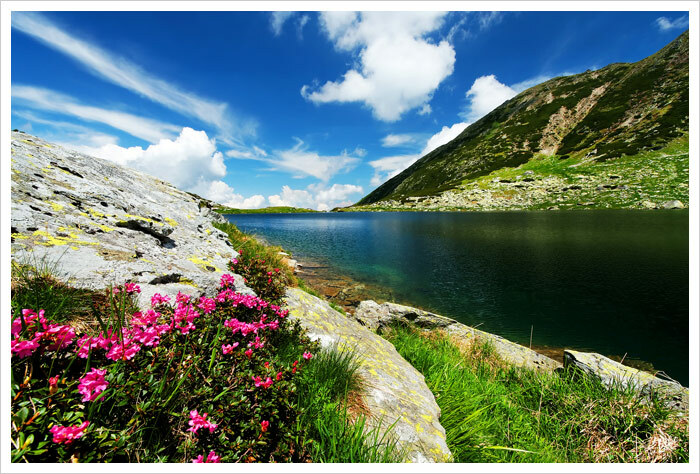 Over one third of the Romanian flora can be found in the Retezat Mountains. High meadows create a haven for rare alpine flora. Long, steep slopes are covered with different types of forest, especially beech, spruce and fir. At the sub-alpine level, slopes shaped by ice are often protected by dwarf pine. The forest line reaches 6,080 ft. with some Spruce adapted to the harsh climate. More than one quarter of the mountain range is above the 5760 ft. altitude where timberline and glaciers have created terraced valleys that end in magnificent glacial bays, lakes and waterfalls. Extraordinary passes, gorges, cavernous limestone caves and sinkholes can be found on the South-Eastern part of the mountain range, in the limestone area of the Retezatul Mic (the Small Retezat). Wildlife enthusiasts will find here many species of animals, including chamois, red and roe deer, wild boar, bear, wolf, and fox, and may come across lynx tracks. Otters find themselves at home in the park's rivers. Chaffinch, song thrush, ring ouzel, red-breasted flycatcher, chiffchaff, nutcracker and the rare golden eagle, leaser spotted eagle, eagle owl, pigmy owl, crag martin, scarlet rosefinch, three toed woodpecker, horned lark are among the 120 nesting bird species of Retezat. Retezat National Park was included in the Important Bird Areas Network. Butterflies are abundant in Retezat, in number and species, and specialists designated two Prime Butterfly Areas here. For the Northern park entrances there are mini buses from Ohaba de sub Piatră to Carnic in the summer time. For the Southern park entrances there are regular mini buses from Petrosani to Buta and Cheile Butii and from Lupeni to Campu lui Neag. Note: For departures from/to Bucharest please select Bucuresti Nord. Tourist pensions can be found in the nearby villages and around the towns. For a list of available accommodations nearby Retezat National Park please check our Accommodations Guide (please enter Retezat Park under "Location").